Past information on this part of the old Thames Goldfield, shows it was originally an area for the miners' camp. Below is an early view of Block 27 from the Una Hill, looking down towards Shortland Landing/Wharf. 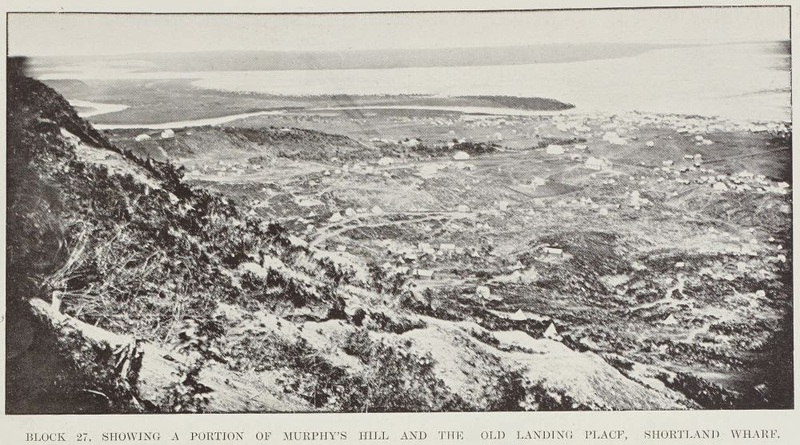 It is interesting that the description reads: "showing a portion of Murphy's Hill" - normally we associated that more with the Franklyn Street area, but could this mean that it is the hill west of present day Sandes Street (at the base of Franklyn Street). Over to the top left you can see what was known as the Mt Pleasant area and the Hape Road running along on the flatter ground. The other road running across the middle to the Una Hill, should be Richmond Street. Unless anyone else sees some alternative...leaving Hill Street running along the base of the hill, where many of us have early Thamesite families living. Maps and street directories at The Treasury and Thames Library. From the time the Thames Goldfield opened, music halls provided entertainment for the people of The Thames. Musical recitals were put on by visiting professional performers and amateurs from the greater Thames community. Places like the Academy of Music, Theatre Royal, King's Theatre, Oddfellows' Hall and many others were all venues for a wide variety of performances. 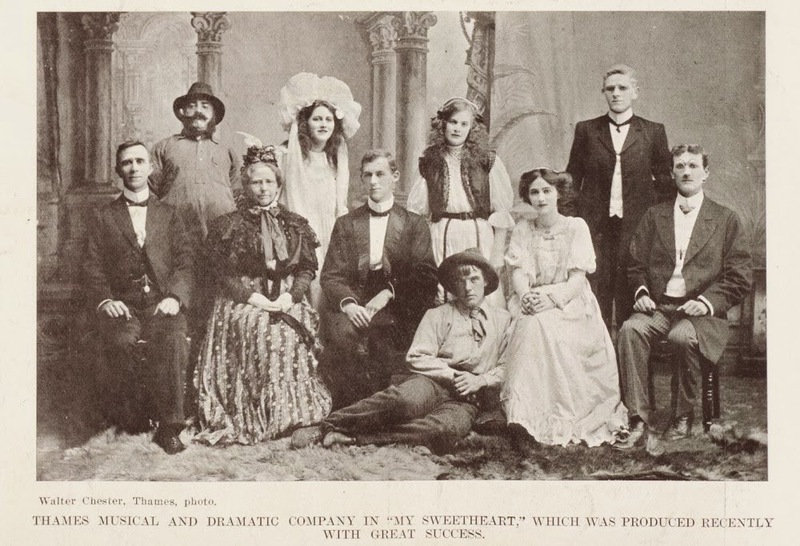 Below is the cast of "My Sweetheart." The Thames Musical and Dramatic Society were involved with this production in February 1909. Cast Members mentioned in the below report are: Tina HATZELL (My Sweetheart), Miss Nellie GIBSON, Miss B MELLETT (Mrs Fleeter), Miss A MCQUADE (Mrs Hatzell), Geo. CRIBB (Farmer Hatzell), Will BONGARD (Tony Faust), W SIMMONDS (Harold Bartlett), Allan MENZIES (Dr Oliver), Mr ARMSTRONG (Joe Shottwell) and Dudley HARCOURT (A Winkleman). Another early wedding photo. Don't forget if you have any early wedding photos of marriages at Thames, The Treasury has a special collection for these. A named digital copy would be appreciated. Contact The Treasury for more information. 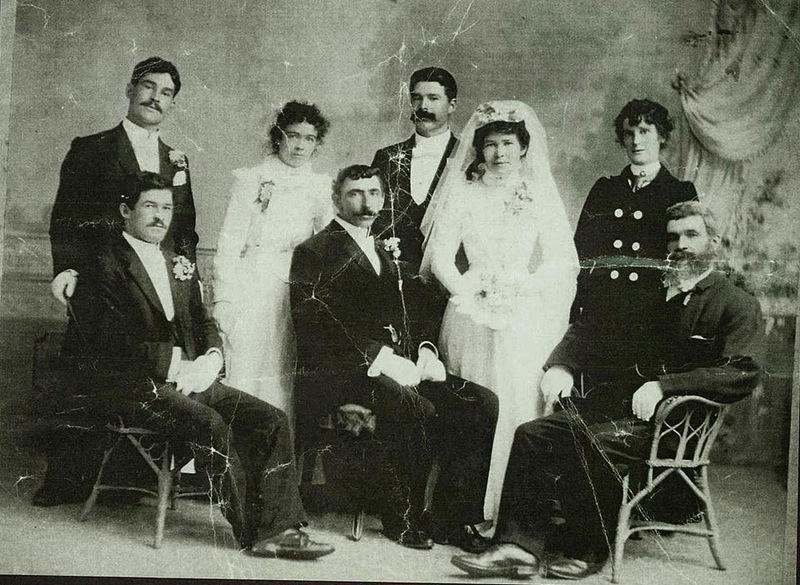 This is the wedding of James MACOWN to Clara MEEHAN in 1900. Back row: John Meehan, bridesmaid Sis Kenny, Bill Meehan, Madge Meehan (in frock coat). Front row: sitting: Jim Meehan, groom James Macown, bride Clara Meehan (standing), Father of the bride Patrick Meehan. Clara and James married at St Francis Church, Thames on 24 October 1900. Family background: Clara's parents were Patrick and Mary Meehan. Patrick was an early settler on the Thames Goldfields. He was interested in various mines, and carted a lot of quartz to batteries for the various companies. 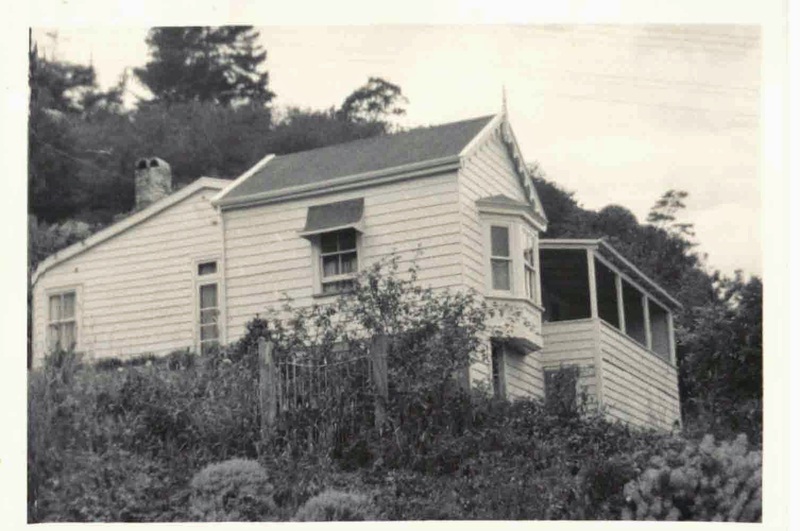 He saw many ups and downs on the goldfield and after 48 years residence in Thames, went back to Auckland. Patrick MEEHAN died 31 July 1929 at Auckland, in his 84th year. His obituary in the New Zealand Herald remarked that he was "an old resident of Thames." Another great find today at Auckland City Libraries Heritage Photo website. First time I have seen this building/angle at close range. Described as the new Isolation wards that opened in 1909. (Possibly No 10 or 11 in bottom photo). The Baillie Street 'Thames Hospital' is in the background on the right. The houses on the hills above the ward are in Edward Street, Thames. I know I keep saying it...but remember to keep on looking back at places you have previously visited, when hunting for genealogy or history information. The wonderful Auckland Libraries Heritage photo site, never ceases to amaze. I will be collecting some of these and posting to the facebook page over the next few days. 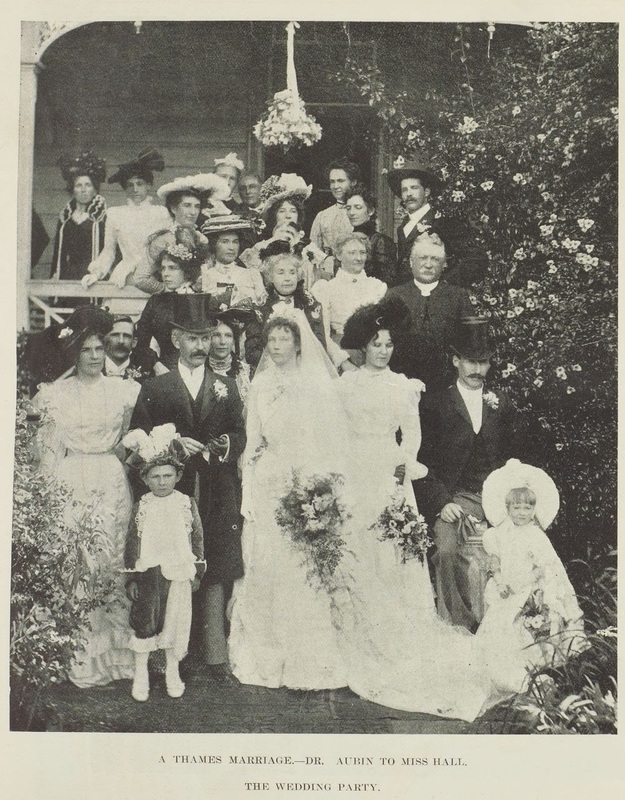 For now here is the wedding of Dr Aubin, a much loved Thames Dr of the early 1900s. Matron Stewart of Thames Hospital is in the 2nd row from the front, 2nd from the right - dressed in white. A THAMES MARRIAGE.—DR. AUBIN TO MISS HALL. THE WEDDING PARTY. AUBIN-HALL.-On 11th February, at St. George's Church, Thames, by the Rev T. O'Callashan. D.D., Dr. E. D. Aubln, B.A., M.B, B.S. (London), M.R.C.S. L.R.C.P., Medical Superintendent, Thames Hospital, elder son of the late John Aubin, of Pirongia, to Florence Lillian, younger daughter of the late J G. Hall, of Thames. Remember also that The Treasury at Thames collects/welcomes photographs of Thames Weddings. The School Cadet scheme in Thames was a popular group that lasted for decades. Oral histories give details of the cadet scheme at Thames High School and the drills that were undertaken into the 1950s. The photograph below is from the Sir George Grey Collection, it shows the cadets from the Kauaeranga Baillie Street School. In 1901 the town held a school cadets' picnic and demonstration on Monday 11 November at Parawai. Perhaps the photograph was taken for that event? 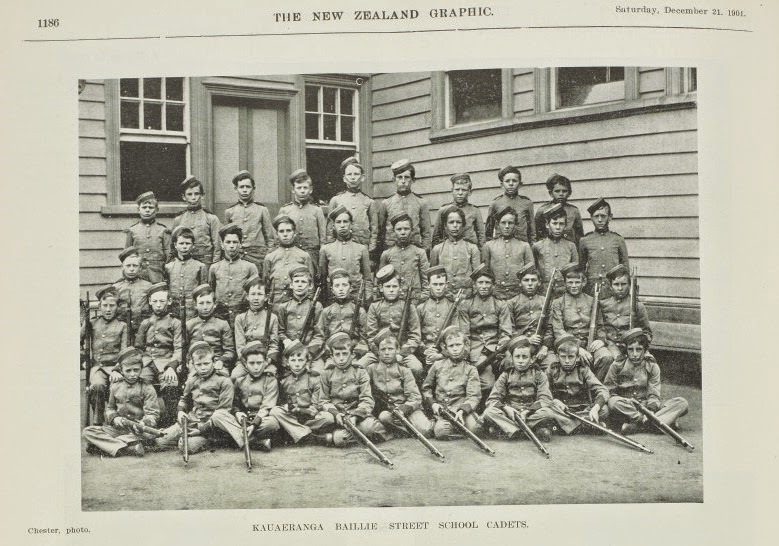 The KAUAERANGA BAILLIE STREET SCHOOL CADETS, 1901. Photographer by Chester Photographers of Thames. It must have been a grand day for the town. The naval cutter took people back and forth along the Kauaeranga River to the event. There were running and tug of war events. The military part of the day, saw Tararu B and A cadets win the physical drill competition. The day ended with a dance at the Miners' Union Hall. Background on School Cadet Scheme appeared in the Thames Star 22 July 1901. "School cadet corps are now recognised by the Government', and some consideration and attention is bestowed on -the movement. The Government has ordered light rifles for the boys of the Sixth and Seventh Standards in their public schools. Probably about 20 of these rifles will be allotted to each school as prizes for drill, and will be used in shooting by different boys in their turn. The Government were met with a difficulty as to the control of the cadet corps, since it was felt, the Premier explained, that the Education Boards might take exception if the control were taken out of their hands. The military training of the youths of the colony, he said, ought to belong to the Defence Department, especially as the Instructors are under the Defence Department; but the question is referred to the Boards of Educations for their opinion." Primary Schools were involved with cadet schemes, as well as Thames High School pupils. Full details for some of the Citizen's Belt competitions are in the Thames Star. Remember the story of the beautiful house at Broad Street, Thames? 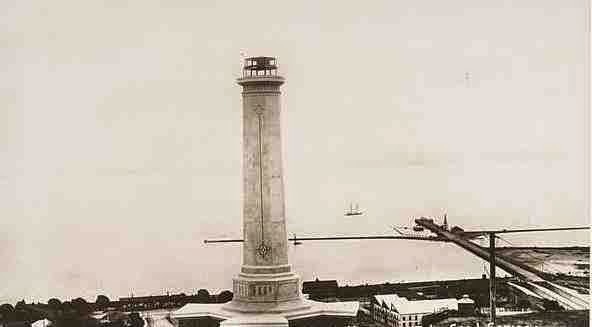 Well a closer look at the full photograph shows that the photo is pre 1872. Reason being that the St George's Church is not yet at the corner of Mackay and Mary Streets. W SIMPSON, Union Cottage; John WRIGLEY, Cabinetmaker; Seth CLARK; Christopher GOODMAN; Stephen RICHARDS, Manager Golden Crown Battery; John STEVENS, Manager Souter Battery; Charles ROBINSON, Master Mariner. Broad Street House identified by family as the Comer homestead. Note the fretwork, identical to the early photograph. Now, the story gets even better because we now know that from the 1880s to 1920, this was the home of George and Mary Ann COMER and their family. The house underwent renovation many times over the years. Descendants of George and Mary Ann Comer have provided amazing photos of the house (above) and the family (below). What a wonderful family group photo. Just imagine the organised precision required to get all family members so beautifully dressed and groomed, not a hair out of place. 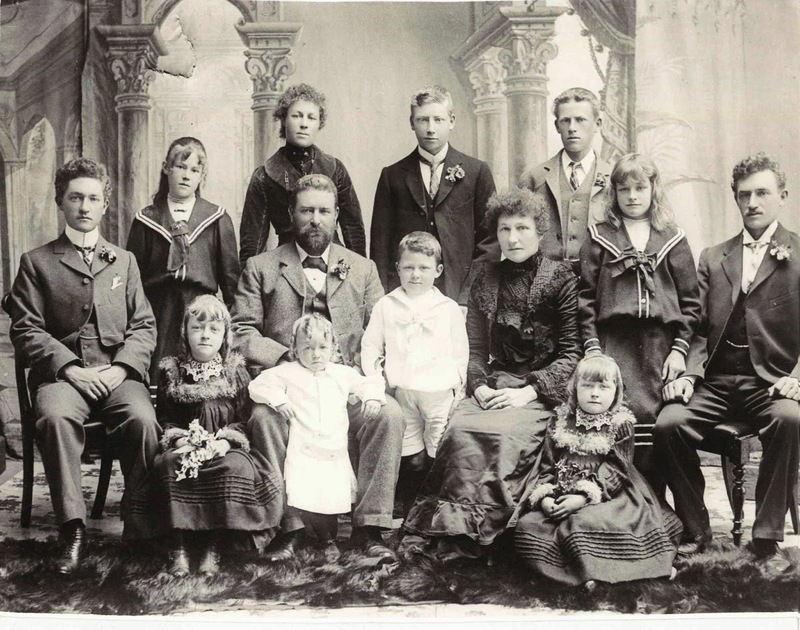 Above: George and Mary Ann (nee Rumsam) COMER centre and 11 of their 12 children, Back row Standing, Lucinda (later MCNEICE), Flora Jane (later NEWDICK), Leonard, John & Anna Gladys (later WILLIAMS). Front sitting in chair- Virney, Father George, Robert, Mother Mary Ann, George sitting far right, very front little girl sitting with flowers – Mary Grace (Grace) (later CURRIE), Frances Cyril (Cyril) and Dorothy (Dolly) (later KEVEN). 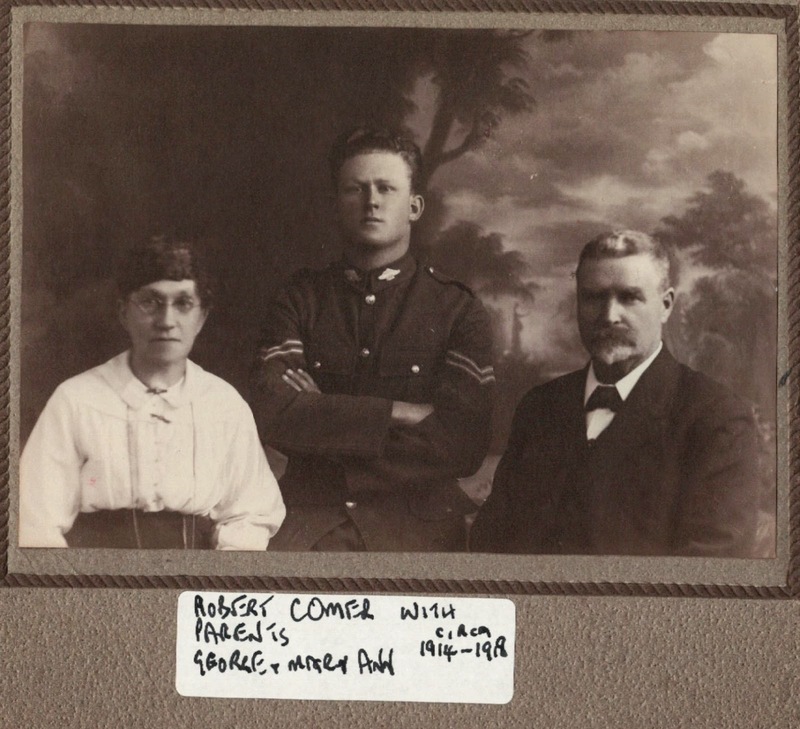 The story gets even better, amongst the family photo collection was a WWI photograph for Robert Comer, posing with his parents George and Mary Ann Comer of Broad Street, Thames. Another photo to add to the collection at The Treasury. Do you have a WWI group or individual photo of a Thames Soldier? The Treasury would love a copy for their WWI Photo register. Yes its official - we finally have a completed book and the launch is just a few weeks away. The flier (right) has full details. Special thanks must go to all the many, many people who have donated so much information, that in turn made writing the book a reality. Pre-orders are being taken for the book $50 plus postage, contact The Treasury for details. 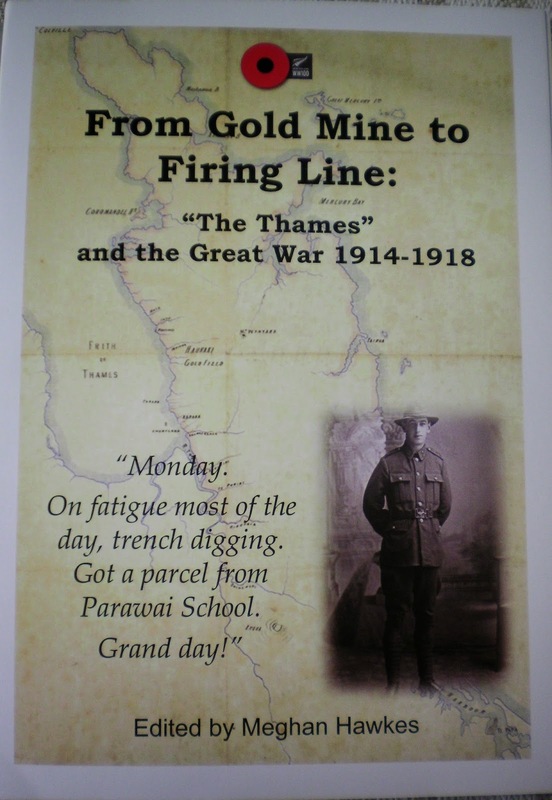 In closing, there will be many more things that come in about Thames (and the greater Hauraki) and the First World War; as a group we hope that the above book is a start to telling the story of Thames & the Hauraki during WWI. "One hesitates to write concerning the war. It is so much in its consequences with us still...I remember, I was on my way to St James' to take the evening service, when meeting a friend, an Anglican, on his way to St George's, I learned from him the latest in regard to the international situation, viz., that England had declared war on Germany...Thereafter, till the close of the great conflict, we never failed in our worship to pray for the cessation of hostilities..."
The Book from Gold Mine to Firing Line will take you on a journey and hopefully uncover a few surprises along the way. Most of all, it is a chance to stop and remember the men and women who served in the war, and their families back at The Thames. AA Maps played an important role in guiding tourists around the country. Do you remember collecting all the maps when you were heading off on a car trip? No Google Maps and other technology required - just plain old map reading skills. With excitement you would ask, what's our next town? Park Hotel, Brown Street, Thames. 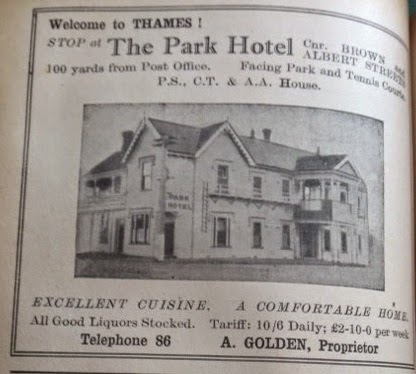 Need a place to stay when you were passing through the town of Thames, A Golden (Proprietor) offered a great tariff and excellent cuisine. Hotel Imperial, Pollen Street, Thames. 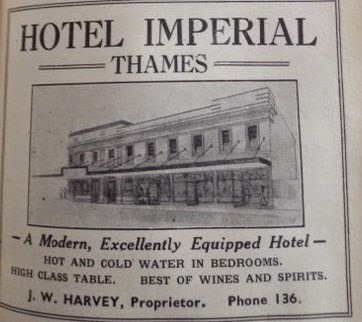 J W Harvey, Proprietor, advertised that the hotel was modern and excellently equipped - hot and cold water in every room! Chas. 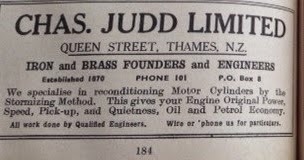 Judd Limited, Queen Street, Thames. If your car engine needed reconditioning - they were the people to see. D McL. 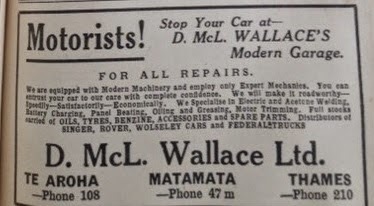 Wallace Ltd, Pollen Street, Thames. Offered a modern garage offering a full range of services for the motorist passing through the town. 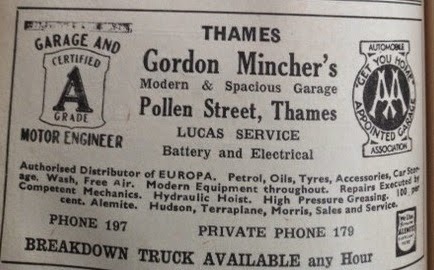 Gordon Mincher's Garage, Pollen Street, Thames. A modern and spacious garage, with a breakdown truck available for the motorist at any hour - just phone Thames 179. 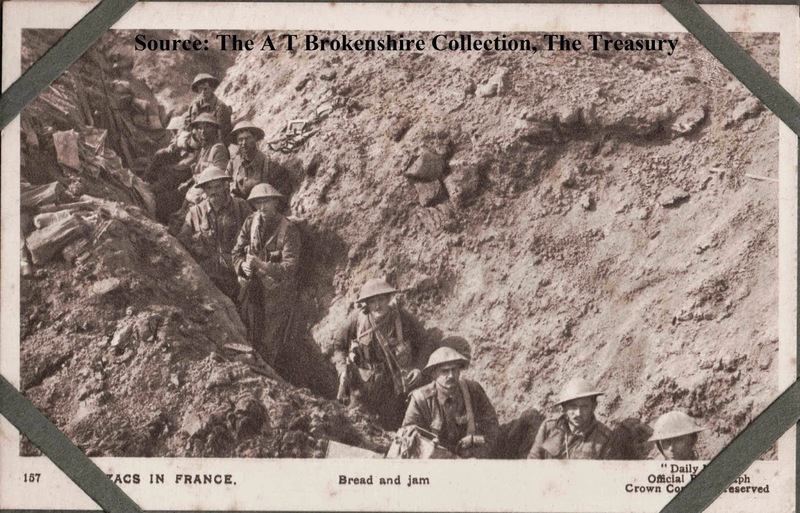 NEWSFLASH: The WWI soldiers' page has been updated by Kae, at The Treasury website. The majority of men on the Thames WWI Memorial have now been identified with links to the Auckland Cenotaph database and newspaper articles. 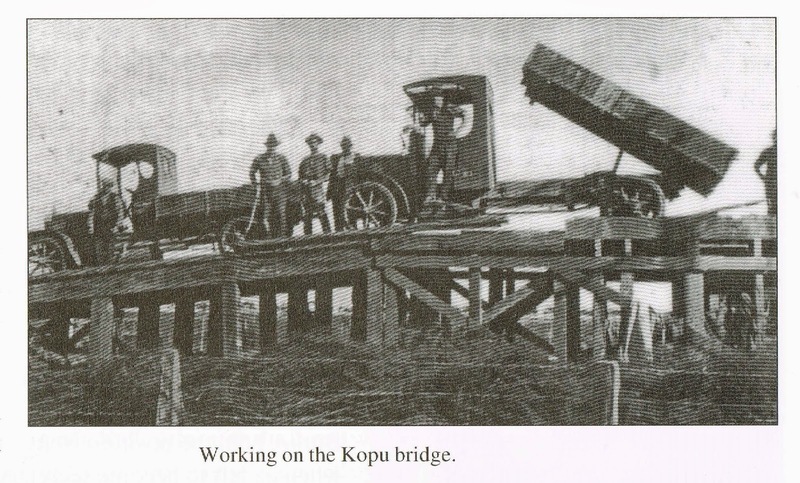 Just a quick note about some more YouTube videos on the Kopu Bridge - old and new. There are lots more..just search at YouTube for "Kopu Bridge." 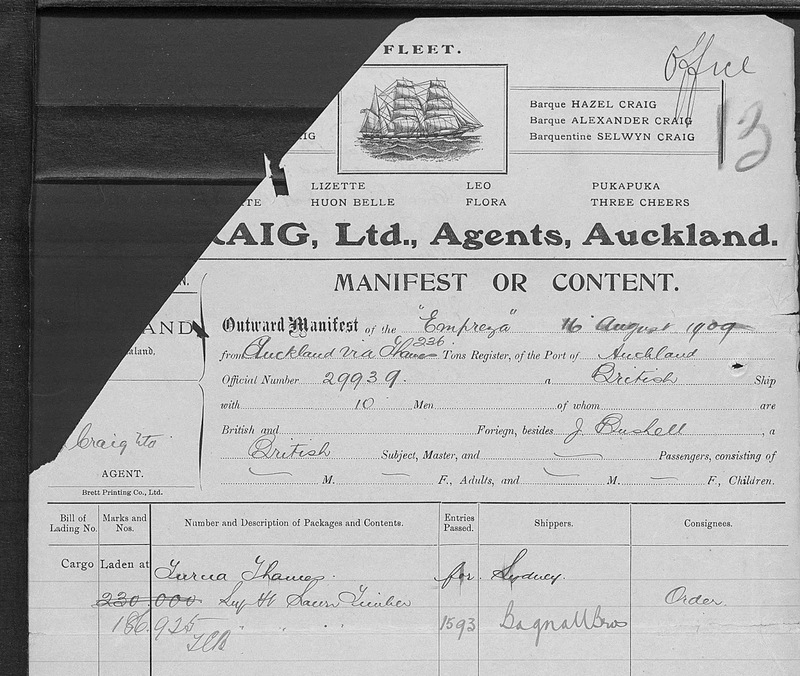 FamilySearch, New Zealand Passenger Lists 1839-1973. The aim is to have all these records indexed, in the mean time it is possible to also browse ships arriving by port and year. There are many other sites available free, while commercial sites such as Find My Past have search options. Early shipping at Grahamstown, before the Burke Street Wharf. Shipping to and from The Thames dependent on the tide. As time goes by, FamilySearch will have more Thames shipping related to cargo ships coming in and out of the once busy port. At present you can view several shipping details for c1900. While not much information is available it is a worthwhile exercise to view the digitised records. They contain manifest and crew lists that were required for custom purposes. Take a look and get familiar with the search technologies available. The Empreza is described as a 236 tonne Baroque, that was built in 1865 in Scotland. On the 1909 visit to Thames, the ship was heading to Turua to pick up a load of timber from Bagnall's Sawmill. Destination was Sydney. Crew members aboard on this voyage were: Captain J BUSHELL; J ?HARMAN, 1st Mate; G MCDONALD, 2nd Mate; Chee POO, Cook; MCCALLUM, J CHRISTIAN, W SMITH, C POULSEN, C CARLSEN and J G ?HARRIS. Do you live in Thames? Maybe your parents or grandparents had a house in Thames. Or maybe you want to look at building details of a shop or premises in the town? Did you know you can view old historical documents free online? I have chosen the example of the King's Theatre at the Grahamstown end of town. In 1941, R Twentyman applied to the Thames Borough Council to undertake renovations to the building. The plumbing work was to be undertaken by Battson's. 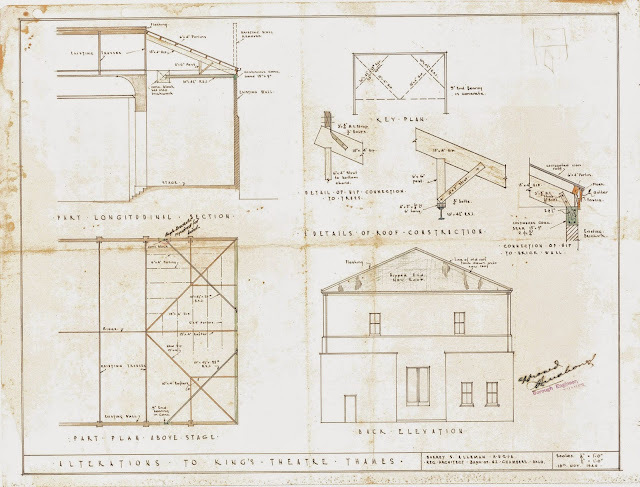 The plans of the building were attached to a written consent. Where can you find this information? Now to Street Name and number and town. If not sure of the number, then enter a block, or alternatively just give Street name. eg. Queen Street or put 700 to 750 Queen Street and see your results. This example allows you to find changes that have been made to The Treasury aka Carnegie Library building. A list of the available applications will now show, click on one to view. The building was opened on 30 January 1913. It was considered state of the art for the time, including having electricity throughout the building - generated with power from Judd's Foundry. The movies of the day were silent movies, supplemented with many live acts and shows. The building is still in use as a movie theatre, although many more renovations have taken place over the years. 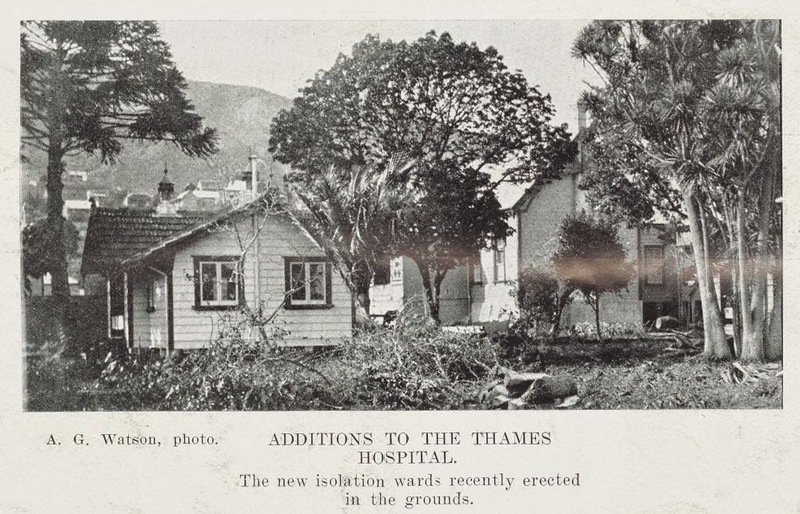 The Kete Hauaraki Coromandel Website has also a large collection of photos of Thames homes and businesses. The Thames Star featured a special Armistice Edition on Tuesday 12 November 1918. The news came to Thames and New Zealand amidst the grips of the influenza epidemic. The day the paper celebrated the Armistice, there were five death notices in the paper. They were for: Donald McKenzie aged 39yr; Margaret Riddell Read aged 33yr; Lily Maude Keoghan aged 47yr; Edith Lavinia Brien aged 41yr; and Henry Simmonds Peters aged 47. The Mayor of Thames announced that the town should celebrate in some way this great news. The Health Authorities over-rode the decision, and decided the town should not have mass peace demonstrations due to the epidemic. They asked that any celebrations be held over until the health of the district improved. So it was not until page three that the people of Thames learnt more about the Armistice. The following year the town observed Armistice Day. On 11 November 1919 a 11am, A & G Price's whistle and the fire bell were rung in the town. Everyone came to a standstill (whether on foot or in a car) and stood for two minutes to remember Armistice and World War One. This year, on Tuesday 11 November 2014 the town of Thames will again remember the men and women who served in World War One. All returned and ex-service personnel are asked to gather at 10.45am outside the Thames War Memorial Civic Centre for a parade and remembrance at 11am. Members of the public are invited to attend. Maybe you can make it for this parade? If not, when the siren sounds, stand and remember, just like our fellow Thamesites did back in 1919. When researching the golden rule appears to be relook, relook and relook again. As search engines develop there appears to be a never ending number of finds to be made when using the web. Today's find relates to a great mining video, showing the School of Mines, Thames and a miner at work. 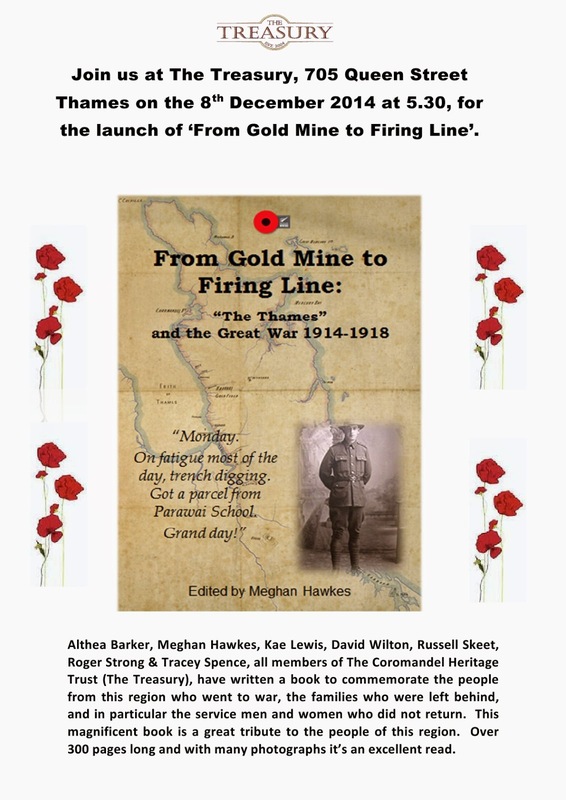 Watch the YouTube video called "The Mining Heritage of Thames." Well done to everyone involved! 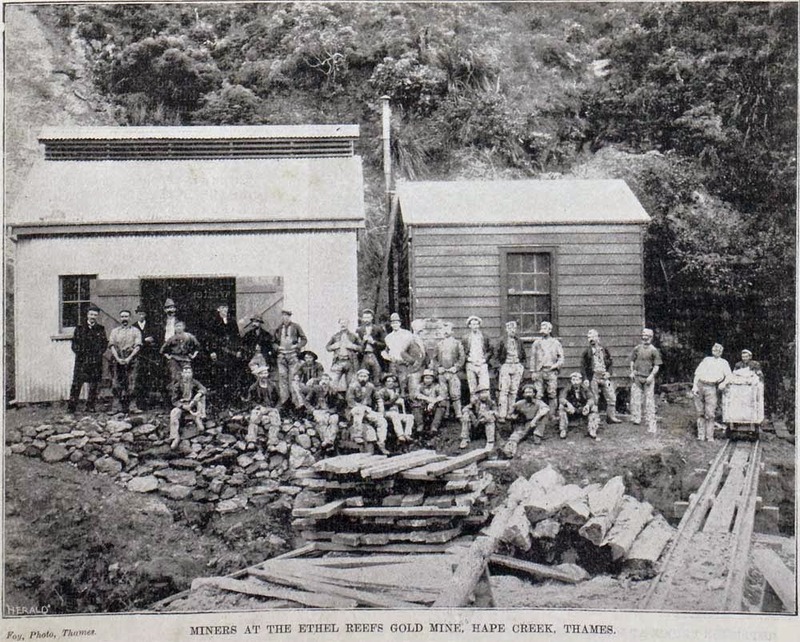 Waihi Gold Mining Take a tour around the present day mining operations. If you find more that you think would be of interest, send me the links and I will add them to the list. The Hauraki Herald today (7 November 2014), published an obituary for a past Thamesite which reminded us all of the important role that the early Chinese played in the business community. From market gardens in the town and surrounding district, to produce shops and a vineyard. In 1925 Joe Ah Chan began growing grapes at Totara and established Gold Leaf Vineyards. To finance this venture he continued to grow and sell tomatoes and vegetables, and purchased a further 22 acres in the Kauaeranga Valley to expand his market gardens. In 1929, with assistance from Andrew Sinkovich, a wine-maker from Henderson, Ah Chan produced his first batch of 1,000 gallons of wine. He was reputedly the first Chinese wine-maker in the southern hemisphere. Source: The Encyclopedia of New Zealand. In 1950 Ah Chan sold the vineyard to a distant kinsman, Stanley Young Chan, who changed its name to Totara Vineyards SYC. It was the obituary for Stanley Young Chan's wife Janet Chan that appeared in todays Hauraki Herald newspaper. The obituary written by H Wong, mentioned that "Janet and her extended family arrived in Auckland on 10 October 1939." The families having escaped the horrors of the Japanese War. War refugees arrive from China. Some of the party of 30 Chinese refugees from the Canton area who have been brought to the Dominion by relatives in New Zealand. 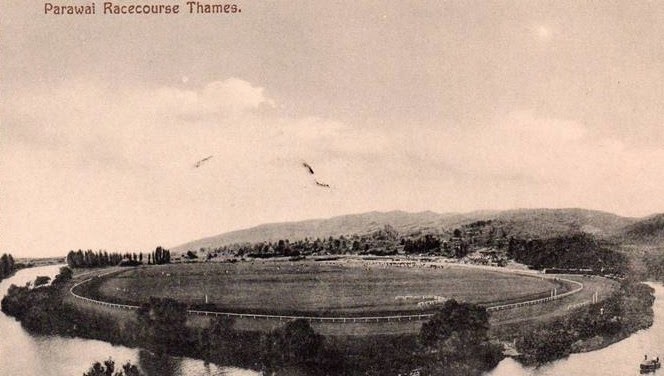 Horse racing on the Thames Goldfields was an important and well respected pastime come business for many, many years. For those wanting to know more about the 'sport', the Thames newspapers offer pages of results and related racing news. Even up to the 1950s, pages of the paper are devoted to race results and news from around the district. Johnny Williams' book " Racing for Gold" gives a full history of racing at The Thames. -First Thames Race meeting held at Shortland 2 January 1868. -By mid 1870's racing established, meetings held Parawai and Tararu. 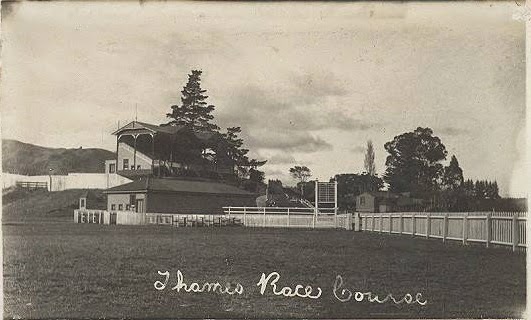 -1901 Thames Jockey Club purchased 50 acres of land from Robert Comer and 43 acres of Native land. Parawai course developed. Track originally left-handed and 6 furlongs. 1926 track altered to a right-handed 7 furlong track. The Thames Star 4 November 1914, gave the result of the Melbourne Cup that was run Tuesday 3 November 1914. Kingsburgh was first, followed by Sir Alwynton, and Moonbria was third. The irony that the results fit to the side of the reality of war and the reports that were flooding the paper.